Better Vampires Patch for Requiem. Please help with any bugs. SoT Patch included. This patch removes crime gold, bounty, murder, and Thieves Guild/Dark Brotherhood membership, as conditions preventing blessings from the nine divines. Optional file for Talos blessing where it does not check your side in the civil war. Patch for Bolts Vizualized - Use this INSTEAD of ExplosiveBoltsVisualized.esp! Pick one (Regular for DG users, HF for DG and HF users, or DB if you have all DLCs) SIC patch optional. Requiem Patch for Closed faced helmets. Includes main file,Dragonborn patch and Legendary version. Use one file or the other, but not both. Requiem - Dragonborn. DOWNLOAD REQUIEM RESOURCES AND ACTIVATE THE .ESP RIGHT AFTER REQUIEM.ESP. Requiem - Falskaar Patch. DOWNLOAD REQUIEM RESOURCES AND ACTIVATE THE .ESP RIGHT AFTER REQUIEM.ESP. 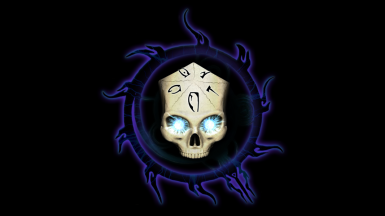 Requiem patch for GDO. Not needed if you use the WAF patch. Requiem - Hard Times. Makes Requiem a little tougher. DOWNLOAD REQUIEM RESOURCES AND ACTIVATE THE .ESP RIGHT AFTER REQUIEM.ESP. Immersive Armors patch for Requiem. Includes my optional battlemage gear and optional NPC patches. 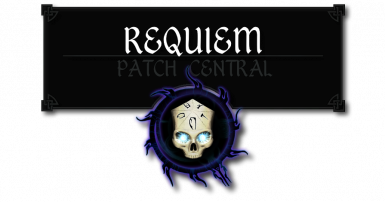 MoMod patch for Requiem. DB and SIC patches included. Requiem Patch for Moonpath. DOWNLOAD REQUIEM RESOURCES AND ACTIVATE THE .ESP RIGHT AFTER REQUIEM.ESP. This is for RS (relliosavini) MODS. Populated Towns and Cities Patch. Includes Populated Cities, Forts, and Dungeons patch. Requiem - Radiant and Unique Potions Poisons and Booze Patch. Resources for all of my mods. Requiem patch for RSkyrimChildren. SoT patch included. Sands of Time Patch for Requiem. Contains main file and optional compatibility patches. Skyrim Coin Replacer Redux patch for Requiem - Hard Times patch included in you need it. Skyrim Immersive Creatures Patch. Includes option Dragonborn and Draugr and skeleton reduced armor patches. Requiem patch for SBF. Tons of compatibility patches included. Use my included versions of Skytest (approved by mod author) to insure compatability. Use one of the main files (Regular patch for Dawnguard users, Hearthfires patch for HF users, or DB patch if you have ALL the DLCs. HT and SoT patches also included. Requiem patch for SPTConsistentOlderPeople. Choose only one depending on your setup. Choose one file depending on how much gold you want your vendors to have. USKP Patch standalone for Requiem. For those who want USKP fixes without having to use Hard Times. Combo patch for Weapons and Armors fixes and Cloth and Clutter fixes. Wyrmstooth Patch for Requiem. DOWNLOAD REQUIEM RESOURCES AND ACTIVATE THE .ESP RIGHT AFTER REQUIEM.ESP.